Goku vs Jiren from the 1 hour special of Dragon Ball Super. This was one of the most awaited and Hyped fights in DragonBall History. And looks like Dragon ball Super delivered the hype it had. Goku has Gotten an awesome new Technique, "Ultra Instinct", But Jiren still has no need to go Full Power. Witness one of the best Fights in DragonBall History. If you enjoy this video, then be sure to check out my other AMV Hit vs Jiren | Stand Up which are also pretty great. The animation, The Fight Choreography, The Suspense and the reveal of Goku's new form, everything were great. I actually enjoyed this fight a lot. And i am also sure that all of you guys did as well. With The anime going on Hiatus after March 31 2018 so i decided to re share one of my most well received AMVs. If you are a true Dragon Ball Fan then you would definitely enjoy this great video. So i ask of you to share it with your friends on Google, FaceBook and Twitter. It will really help my site grow. 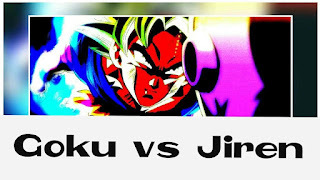 I make Dragon Ball Super Articles, Videos, Theories, episode Reviews, Top Lists, Vs Battles with differnt characters and write Amazing articles about the series Dragon Ball. Be sure give a Positive reply about what you enjoy. Or if you have any suggestions then be sure to contact me using the comments section, The Contact us page or by filling out he contact us form below.